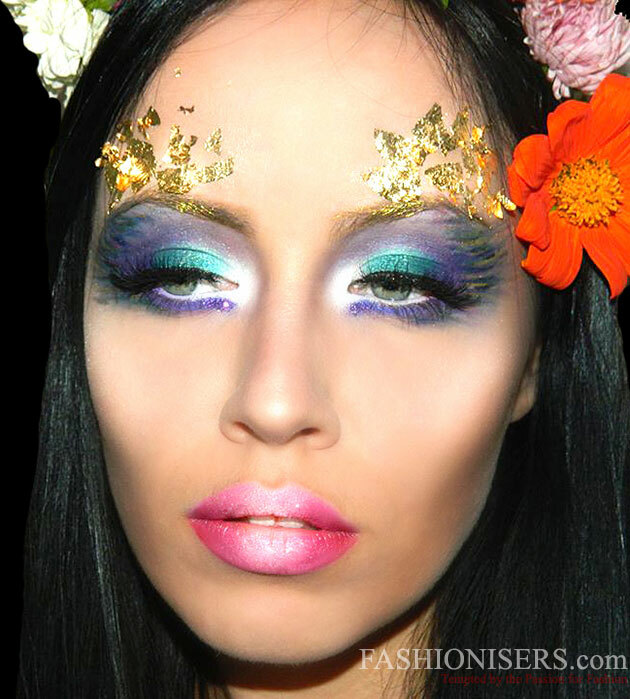 Although Halloween makeup is principally to scare people and surprise everyone with your unnatural, unrecognizable, but also spooky look, fashionisers, who can never imagine themselves unflattering, can opt for more feminine looks instead. It’s equally creative to be a forest fairy on this day or a glam vampire. 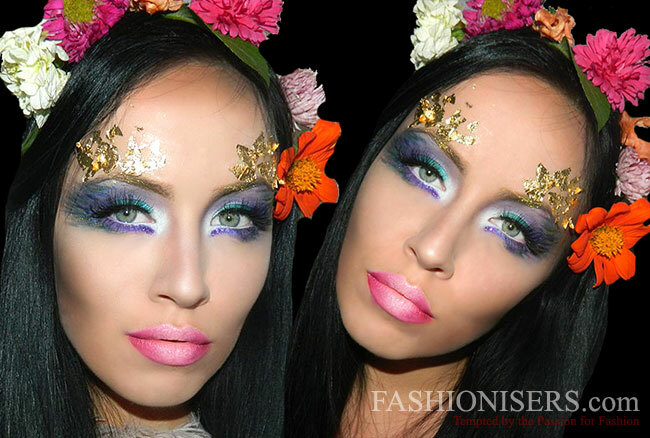 Today, we present the gorgeous Mother Nature/ nymph Halloween makeup tutorial for an absolutely breathtaking makeover for the fun holiday to come! Feel divine on this day and stand out at the party with your fabulous nature-inspired look that will draw all eyes on you! Step 1: Like in the case of any ordinary makeup, here too you need to first create a flawless base. So wash your face and apply the base and foundation with a makeup brush for smooth results. Slightly highlight and contour your face afterwards. Step 2: Contour your eyebrows with a light eye pencil. Step 3: Apply primer and a base all over your lids. To the inner corner of your eye, apply a shimmery white eyeshadow with blue undertones (from Bourjois Smokey Eyes). Next to the white eyeshadow, put a little shimmery bluish green tone (Sassea from the Sleek Lagoon Palette). Now, apply a matte dark bluish green tone to the center of your lid (Orbit from the Sleek Ultra Mattes Dark Palette). Step 4: Apply a matte purple eyeshadow to the outer V corner of the eye, blending it to the crease (Highness from the same palette). Blend the purple tone with a lighter indigo color (Night Sky from the Sleek Lagoon Palette). Step 5: Apply a white base on your lower lid. 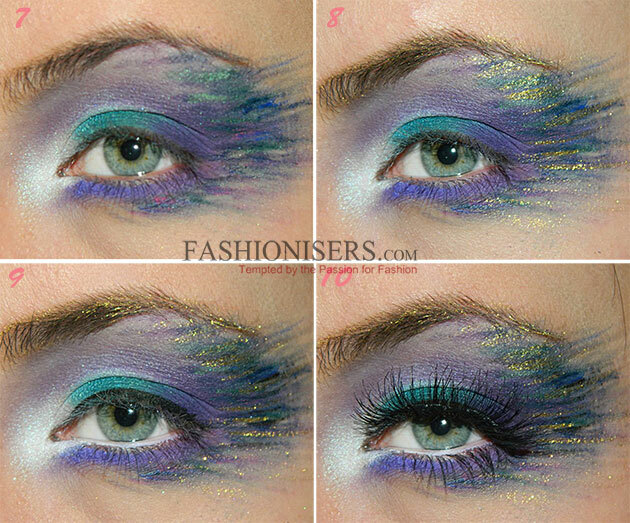 To the inner corner of your lower lid apply a matte purple eyeshadow (Highness from the same palette). Now, use a darker purple tone to the outer part of your lower lid (from the Coastal Scents Smokey Palette). Step 6: Take an angled brush or a liner and draw navy blue strokes on the outer part of your eye. 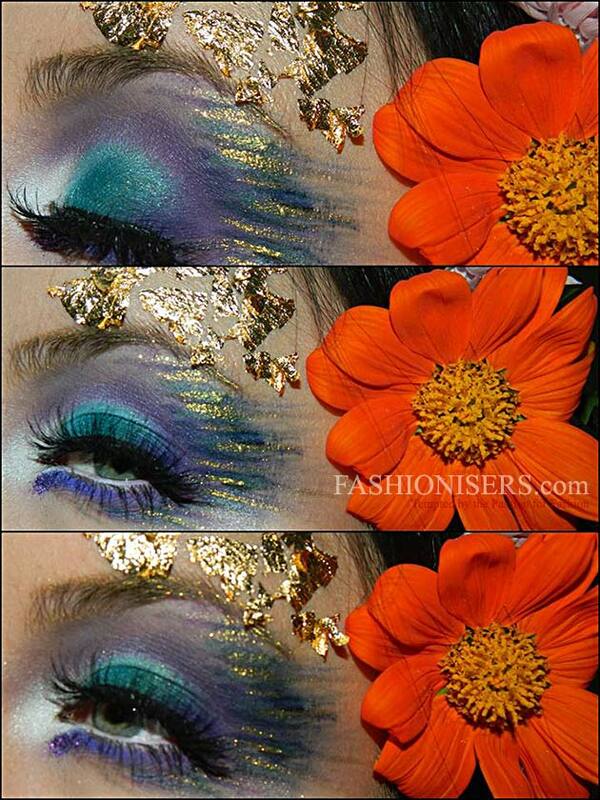 Repeat the same step with purple, green and pink eyeshadows. As a final step, draw some strokes with gold eyeliner. Step 7: Apply black eyeliner as close to your lash line as possible. Next, highlight your waterline with a white eye pencil. Apply black mascara and false eyelashes for a more fairy-tale like gaze! Step 8: Using the same lash glue, stick the gold flakes above your eyebrows. Step 9: Apply NYX Jumbo Pencil in Milk all over your lips. Using a dark red lipstick and a magenta one, create ombre lips effect. Apply a lip-gloss to the center of your lips, and then use white/ translucent shimmer over it for a frosty effect. Step 10: Highlight your cheekbones with a white shimmery eyeshadow. Your mesmerizing Nymph Halloween makeup look is ready! You just need to apply some flowers on your hair or wear a flowery head-crown. Don’t forget about a Mother Earth appropriate costume for an utterly memorable appearance!